Depicted are (A.) Ranitomeya uakarii (Brown, Shulte & Summers, 2006) of the (D.) Amazon Basin & (B.) Pitohui dichrous (Bonaparte, 1850) of (E.) Papua New Guinea. Both are examples of species that utilize (C.) Batrachotoxin, a potent steroidal alkaloid, as a means of defense. Uakarii is a member of the family Dendrobatidae, the so-called "Poison Dart Frog". The word batrachotoxin literally translates to "frog poison". Neither species produce this toxin naturally. It is acquired through dietary sources. 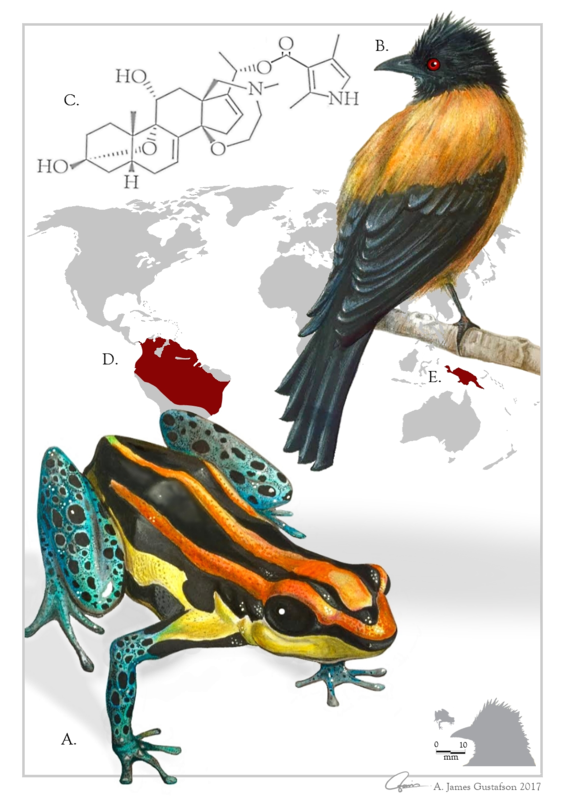 Batrachotoxin is present in Choresine beetles, a dietary staple of various subspecies of birds endemic to New Guinea, of the genus Pitohui. It is widely believed that a similar species of Melyrid beetle is likely the primary source of Batrachotoxin in Dendrobates.